Branch of the All Bar One chain by Butler's Wharf near Tower Bridge. It is on the east side of the bridge, facing the river and near the [Design Museum]?. secretlondon visited on Wednesday evening in April 2009. 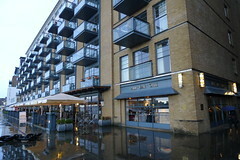 It is open and fairly bland with tables outside facing the river. As well as lots of wine they sell a range of more interesting lager and some beer such as London Pride. A round of a pint of London Pride and Erdinger Weissbier cost £7+ in April 2009. There was some background music playing. Food is served 11am-10pm Monday-Wednesday, 10am-10pm Thursday-Saturday, and 10am-9:30pm Sunday. Last visited by secretlondon, April 2009. Opening hours and food times taken from website. Last edited 2019-04-16 10:59:57 (version 4; diff). List all versions. Page last edited 2019-04-16 10:59:57 (version 4).